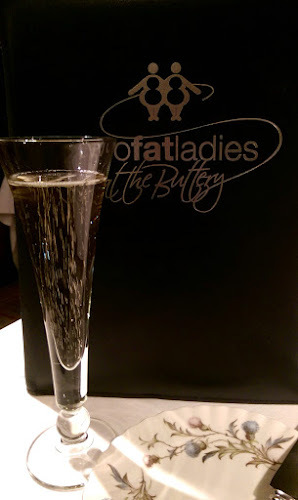 Over the last year we have been lucky enough to eat some fantastic meals however one of the best meals in recent times also happened to be one of the least expensive too when we had lunch at Two Fat Ladies at the Buttery. The original Two Fat Ladies opened in 1989 on Dumbarton Road in Glasgow's West End and the group has grown to four restaurants with The Buttery opening in 2007. I had heard so many great reviews about Two Fat Ladies but had never managed to find the time to get along to any of their venues. When I spotted that the website, Itison was selling a lunchtime deal which included three courses and a glass of champagne for two people at the discounted price of just £25, I didn't hesitate and snapped up the offer. We arrived a little late for our reservation thanks to me thinking that the restaurant was somewhere else but after a short taxi ride, we arrived safely and took a few minutes to catch our breathe with a lovely chilled glass of champagne. 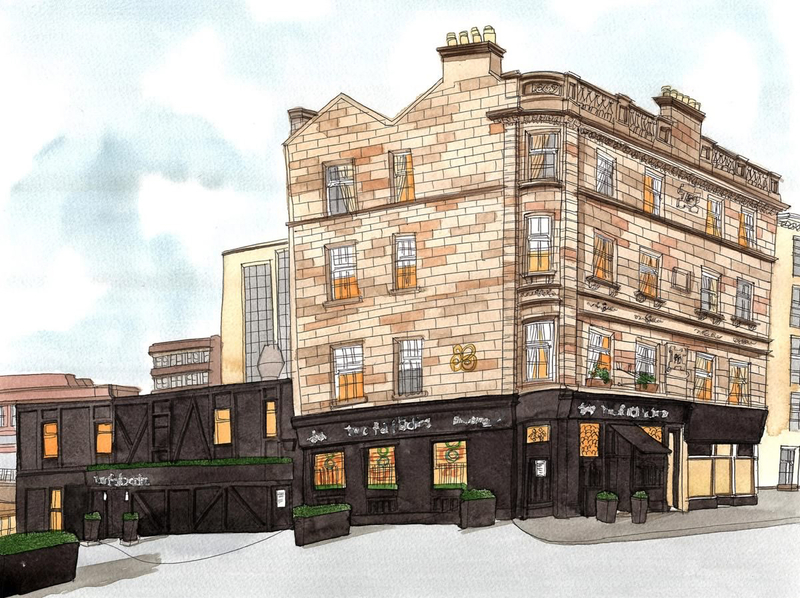 Two Fat Ladies has a very impressive wine list to suit all budgets plus a few wines recommended by the house. We ordered a very nice bottle of Albariño by Señorio de Rubios, priced at £30. Iced tap water was provided without having to ask. The lunch menu is normally priced at £16.95 for two courses or £19.95 for three courses which is a great deal when you consider that there are four choices for each course. To start, Nicola went with the Home Hot Smoked Salmon, Potato & Red Onion and Quails Egg, which was delicious. 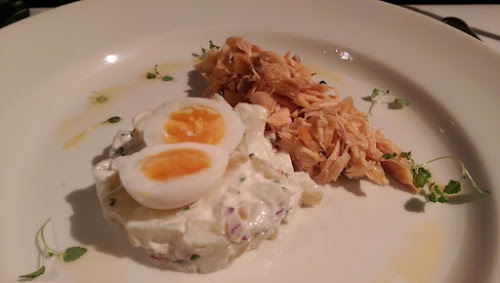 The succulent salmon had a subtle smokiness that worked well with creaminess from the accompanying potato salad whilst the quails egg lifted this dish to another level. I had eyed up the salmon as my own starter but as I was having fish for my main, I decided to go with the Chicken Liver & Truffle Pâté, Melba Toast and Plum & Sultana Compote. The liver was smooth and silky, with just enough truffle flavour to cut through the rich liver flavour. 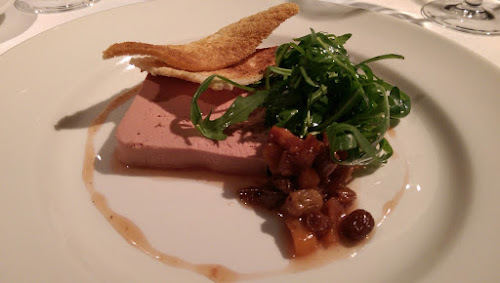 The sharp compote was a great contrast to the richness of the pâté. If I had to critisice, I mouldy have preferred a little more melba toast for the decent slice of pâté although I'm sure that if I had asked, they would have been more than accommodating. 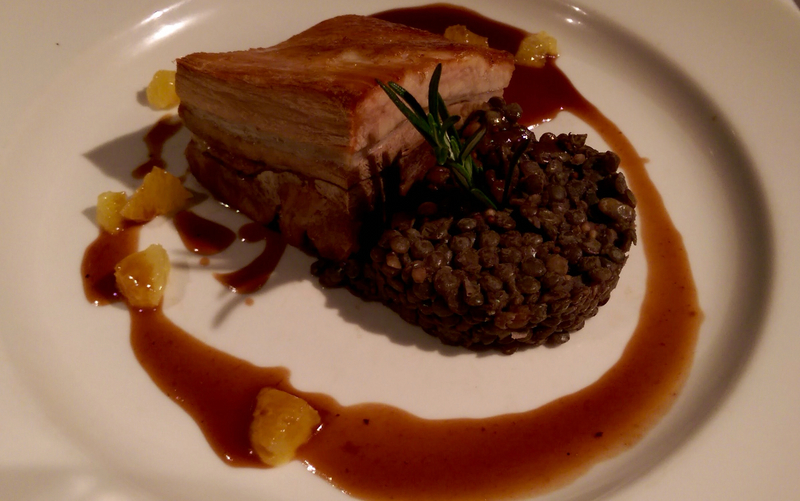 For her main, Nicola ordered the Braised Pork Belly, Puy Lentils with spiced orange jus. This was a stunning plate of food. This was one of the best pieces of pork belly that we have tasted in a while. Crispy crackling on the outside with soft, melt in the mouth pork underneath. The Puy lentils were well flavoured, their earthiness working well with the sweet braised meat. Normally Nicola isn't a fan of fruit flavours being on her dinner plate but the spiced orange jus, rounded the dish off well. I nearly picked the pork too but the sound of the 'fish of the day' grabbed my attention. 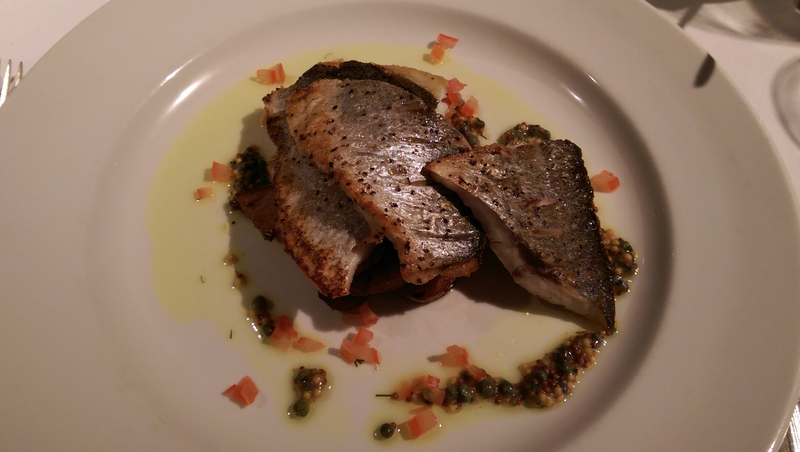 The Sea Bass fillets served on a bed of Lyonnaise style potatoes, with mustard & caper dressing as divine. The delicate flavours of the fish were in perfect harmony to the sharp and salty dressing while the stack of buttery potatoes added a little substance to the overall dish. I've had a lot of sea bass in my time and this was definitely one of the best. We were served a side dish of roasted vegetables and potatoes. 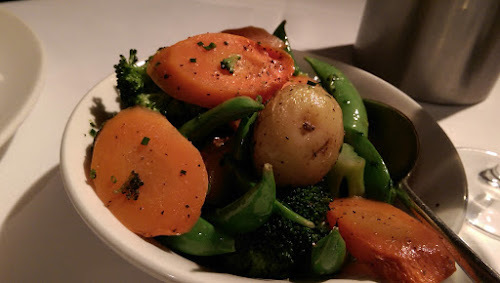 All of the veg was cooked well and was a welcome accompaniment to our main dishes although if I'm being honest, if they hadn't served the vegetables, I wouldn't have minded as the portion sizes were more than generous. We were both feeling pretty full by this point but the deal included a third course so we both avoided the cherry fudge pie and opted for the lighter options. Nicola plumped for the honey and Glayva liqueur parfait with toasted oat crumb. The parfait was smooth and creamy and well flavoured with a rich honey flavour but we both struggled to detect much Glayva. 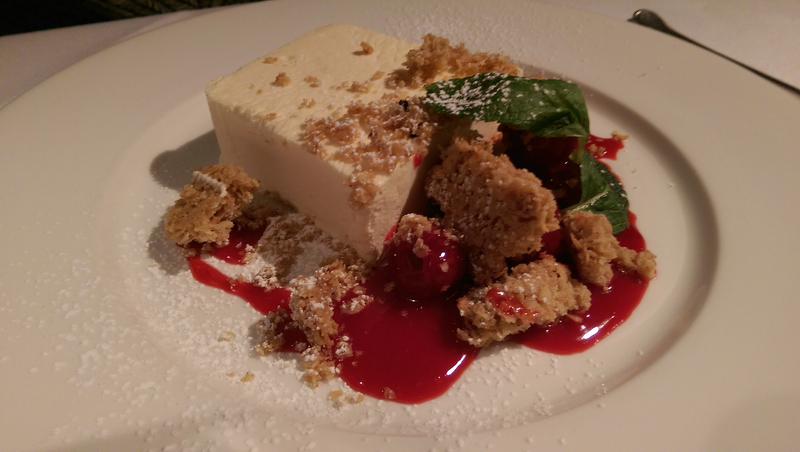 That didn't matter though as the parfait was the perfect way to end a hearty meal. I really fancied the cherry fudge pie but knew that there was no way that I would manage to fit it in so ordered the homemade brandy basket, duo of iced read and fruit coulis, and I'm glad that I did. 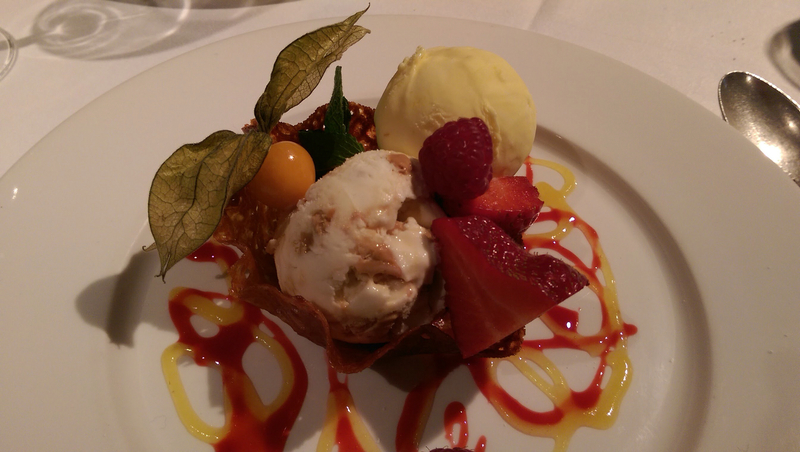 The brandy snap was perfectly crisp and filled with a scoop each of Scottish tablet ice cream and saffron flavoured ice cream. Yip, I said saffron. As with most things that have had saffron added, the savoury ice cream was a deep yellow colour and a subtle floral flavour that tasted good on it's own but even better alongside the sweet tablet ice cream. I'm not the biggest lover of ice realm normally but I could have easily eaten another couple of scoops. By the time we had finished our desserts, the lunchtime service was almost over and it was time for us to get on our way so asked our waitress to call us a cab so that we could take the short ride back over the M8 motorway so that we could grab a few post-lunch drinks. As I said at the start, this was one of the best value restaurant deals that I have ever bought and wouldn't hesitate in buying it again. I'm not sure that there's a better way to spend £25. In fact, now that we have eaten at Two Fat Ladies and know the quality of food that they serve, I wouldn't hesitate in going back in the future and paying full price. So if you're looking for somewhere that serves delicious food at reasonable prices, I can't recommend Two Fat Ladies enough. Keep up to date with Two Fat Ladies on Facebook and Twitter.